It’s just about that time again – time to go back to school! Our very own turtle is ready to go – he has his backpack on and his lunch box in his hand. He is ready to learn! Print and color the turtle for some back to school fun. 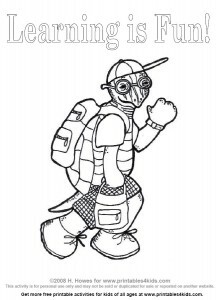 Or download Turtle Goes Back to School Coloring Page as a PDF file. More Franklin Printables at Nick Jr.